Compare diverse active series, understanding and transferring the SAR to your own. Receive a score on every design using shape, electrostatic similarity or both. Find critical regions in your SAR with Activity Miner. Torch provides the framework to inspire and validate your molecule designs. The easy-to-use, wizard based interface guides you through experiment setup and provides an intuitive interface to view your results. Whether you are designing single molecules or small libraries, Torch gives you the confidence and validation to progress rapidly from idea to the next best synthesis. Contact us to enquire about upgrading from TorchLite to Torch. Torch is intuitive and easy to use, however, if you would like our experts to provide training contact us. 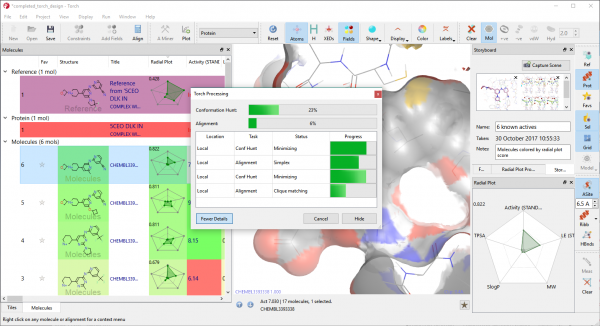 TorchLite is an excellent way to view and edit structures in 3D, helping you to understand how your molecules behave in a biological context. However, with an upgrade to Torch you can go further, gaining more knowledge, more quickly. See how they compare in the table below. Take a free evaluation of Torch and start designing your next molecule using the power of fields. If you’re a post-graduate, PhD or post-doc student enrolled in a defined degree course you are entitled to free one year named user licenses for Cresset desktop products. Students can apply to Cresset with a description of the project and the intended use of the software. Free licenses will include upgrades but not technical support. Licenses can be renewed while the student remains enrolled in a degree program. Apply for a software bursary here.